Left: M. F. Husain, Lighting Horses, ca. 1979, oil on canvas. Collection of Sri and Harsha Reddy. The writer interviewed a curator, collectors, gallery owners, auctioneers, and artists in New York, Mumbai, and Bangalore to gauge what drives South Asian art and artists. Bangalore-based Chinni Rajputana is passionate about collecting art, but is not too happy about the current state of the South Asian art market. In recent years the artists that she loves to own are not being shown at galleries or auctions. Shandilya Shankar, a New York venture capitalist who likes to turn a quick buck on contemporary Indian paintings, is not happy with the market, either. He feels only the best known names—a Husain or a Tyeb Mehta or a Souza—are fetching demand, making the market quite narrow. Over the past four years, the South Asian art market has been on a rollercoaster ride. 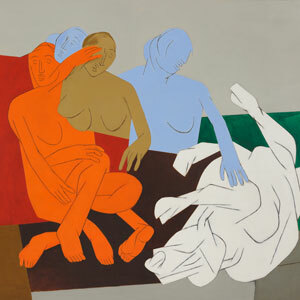 Tyeb Mehta’s Untitled (Figures with Bull Head), sold in March 2012 for $1.8 million, quite below expectations. In September 2010, La Terre, 1985, an acrylic by Raza sold for merely $1.93 million, below its estimated value of $2.5 million. Using another parameter, in March 2012, of 124 lots offered at Christie’s sale of South Asian modern and contemporary art, only 69 percent got sold. At Sotheby’s across town, in the same category, only 57 percent were sold. Those were the downers, but as with any roller-coaster ride, there were the ups, too. Mehta’s diptych, Bulls, sold in 2012 at $2.8 million while Syed Raza’s Saurashtra went for $ 3.24 million, also last year. Underbid or underpriced? Was it a market correction? Or, was there more to this aberration? Depending on who you talk to in the industry, two distinct and contrasting scenarios are emerging. Is art simply a speculative business? The volatility and unpredictability in the art market in general and the South Asian one in particular raises several questions. Why indeed are some works fetching prices that defy logic? What are buyers of such art looking for? A sense of joy or pride of ownership or is it sound investment value for the work? And if it is not investment value, then what precisely is propping up such a price tag? Or, is it also perhaps the legend or hype that is created around the work and the artist? Is art and the promotion of art simply the art of business and marketing? One would imagine so, considering the millions of dollars being spent all over the world on pricey catalogues, promos, and exhibitions. These days everything is a commodity—an item to be well-packaged, well-marketed, and sold. The art aspect or intrinsic value of the artist’s message or opinions and the artist’s skills do not seem germane any more. Has merchandizing taken over from art? In spite of the dips and highs of the stock market and the anemic nature of today’s sputtering economy, art as a commodity seems to be doing well. There are big bucks to be made, and with the right promoters, artists such as Husain or Tyeb Mehta or Souza continue to draw greater attention—more so after their passing. “Indian art is so popular now that several Americans and Europeans with market knowledge of their artists take special trips to other parts of the world to attend public auctions since art is considered a wise investment”, says Deepak Talwar, owner of Talwar Gallery, New York. While price is one benchmark to evaluate an artist, it is not the only one. Provenance (the history, time, and circumstances surrounding the creation of the art) has always been equally important. Quite often, “collector” groups attend private sales that are not reported publicly; neither are prices disclosed. The art world has gotten larger globally with a wider perspective and reach and continues to grow. Talwar draws a distinction between “buying” and “collecting” art. There are several buyers of art with money but it is only the discerning art-literate who is a collector. Today’s buyers of South Asian art are more guarded in their purchases, he observes. His advice: read about the artists, their styles and motivations; inform yourself about the origin and background of a piece before buying it. Persons of Indian origin, not necessarily those based in India, continue to be a driving force in promoting Indian artists’ creations in India. Many bidders at public art auctions are knowledgeable about provenance and prices and could go toe-to-toe with specialists whose job it is to study and evaluate the market. Fluctuations in the prices of modern and contemporary Indian art have led buyers to invest in another significant art tradition—miniatures. “Many people want to invest in [contemporary art], but the explosive rise in prices resulted in the unsustainability of these prices when people wanted to sell. Thus people have started looking at other categories including miniatures as an investment where the rise is slow, steady and sustainable. Of course, even here quality, condition and period is of vital importance,” says Maher Dadha, Chairman and Managing Director, Bid & Hammer, fine art auctioneers in Bangalore. In India, purchases of contemporary art, either as adornment for their own personal spaces or as investment, seem to be de rigueur among the wealthy. 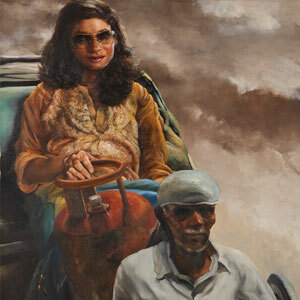 The Mumbai-based artist couple Atul and Anju Dodiya have had exemplary successes. Notwithstanding their success, the vagaries of the art market must have some impact on their creative process. Did consideration of the market ever affect the quality of their work and motivation? As the response to the Dodiyas shows, the Indian art collector and buyer clearly have art on their shopping list. Admittedly the fluctuations in the market have not pleased many investors. But ultimately, with patience and informed investment, the Rajputanas and the Shankars could build up an enviable collection that could offer them both satisfaction and value. “Art has no timeline; beautiful works of art are timeless—to be treasured no matter when they were created. We collect both contemporary art and antiques: it is our heritage, it belongs to all of us. Sri and I are just temporary custodians,” says Harsha Reddy, who with his wife Sri, has been a longtime collector. Raj S. Rangarajan is a New York based freelance, covering trend stories on art, books, and films.